If you’re currently unhappy with the way your teeth look when they’re shown off in photos or at big events, Dr. Atsalis can help you achieve a true transformation here in Plymouth. 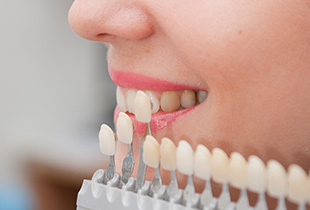 Our practice features a wide variety of aesthetic-based services that can get rid of those frustrating dental flaws, from stains and discoloration to cracks, gaps, and misshapen teeth. To start your very own cosmetic makeover, contact Atsalis Dental Excellence today! Teeth can become stained and discolored over time for a wide variety of reasons, from diet to medication use to simple genetics. Whatever the reasons are for your subdued smile, we want to help you regain a look that truly dazzles with our high-quality teeth whitening options. 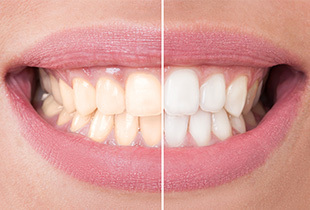 If your priority is speed, our ZOOM!® in-office treatment can improve enamel color by several shades over the course of a single appointment. Alternatively, Opalescence Go® Trays and ZOOM! gel is available for at-home use as well, helping patients achieve the same improvements at a more convenient and flexible pace. 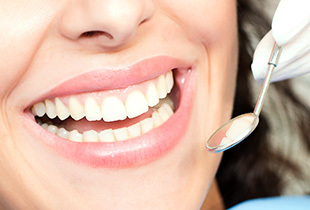 Straighter teeth can bolster your self-confidence, support your oral health, and even improve your bite function! Better yet, Dr. Atsalis offers state-of-the-art orthodontic techniques that are cosmetically friendly and lightning-fast when compared to the traditional braces model we’re all familiar with. Porcelain veneers are ultra-thin, customized dental restorations that are designed to cover just the front surfaces of your teeth. They’re capable of hiding several dental flaws at once, creating a comprehensive solution to your smile woes while giving you a new, beautifully natural appearance. Veneers are highly durable and can remain bright for an impressive amount of time; in fact, they’re even slower to discolor than your natural enamel! Sometimes, patients become nervous when they’re told that they’ll need a new dental crown or other restoration to improve their oral health. This is understandable – traditional restorative materials are noticeably unnatural and can mar an otherwise attractive smile. Thankfully, Dr. Atsalis offers a much more image-friendly alternative! With the help of high-quality, metal-free dental ceramic, it’s easier than ever to repair damaged smiles without anyone but you and our team being the wiser. These materials are comfortable, durable, and 100% biocompatible for an excellent fit. If your smile appears overly uneven, short, or “gummy,” an excess amount of gum tissue may be to blame. During cosmetic gum recontouring, our team will precisely and comfortably reshape the gum line so that it’s much more pleasing to the eye, removing unnecessary tissue and revealing more beautiful, healthy tooth structure that was hidden before. Our goal is to leave you with a final look that you’re ready to show off proudly.